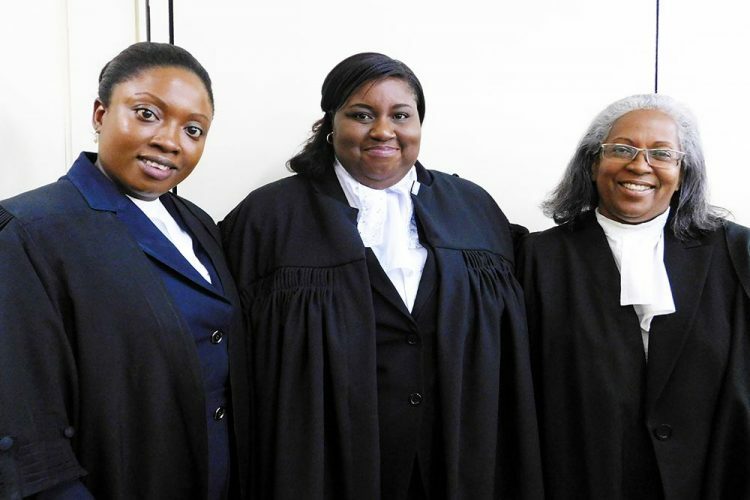 Layou resident and history teacher Taies Thomas can now practise as a barrister-at-law and solicitor at the Bar of St Vincent and the Grenadines. Last Thursday, at the courtroom at the High Court office, Judith Jones-Morgan, outgoing Attorney-General, who moved Thomasâ call, said she believes that Thomas possesses a good character and is a fit and proper person to be called to the Bar. Jones-Morgan described Thomas as an excellent teacher with good mediation techniques, which is a skill which can well be utilized at the local Bar. The outgoing Attorney-General said she was also convinced that Thomas, currently a teacher at the Girlsâ High School (GHS), would continue her professional development and training. Thomas holds a Bachelorâs degree in History, a Bachelorâs degree in Law and a Legal Education Certificate from the Norman Manley Law School in Jamaica. During the summers of 2016 and 2017, Thomas worked at the AttorneyGeneralâs chambers as a legal intern, during which time, Jones-Morgan said she was better able to assess Thomasâs character. â…I was immediately impressed by her quick grasp of salient legal issues, her overall dedication and committment, her industriousness and … I believe Ms Thomas possesses a character of esteem. Sheâs honest, sheâs caring, sheâs disciplined and sheâs quite respectful,â Jones-Morgan said. Sejilla McDowall, who seconded Thomasâ move of claim to the Bar, agreed with Jones-Morganâs assessment of Thomasâs character and added that she is an effective communicator. She said Thomas worked as a scribe at a recent conference organized by the office of the Director of Public Prosecutions and she found her to be very reliable. McDowall said she believes that Thomasâs personality is one that would bring colour to the courtroom. In her appreciation speech after being robed, Thomas began by thanking God. She was effusive and emotional in her praise of her parents, Milton and Susan Thomas. Thomas also thanked her friends, colleagues at the GHS, the congregations of St James Anglican Church, Layou, along with St Maryâs Buccament, St Stephens Church in Barbados and the Mona Chapel in Jamaica. She thanked Jones-Morgan and McDowall, as well as others. Presiding Judge Nicola Byers said Thomas reminded her of how much hard work goes into becoming a lawyer and offered her advice.